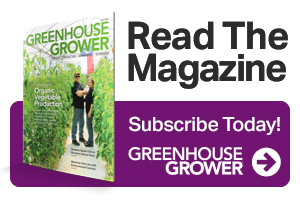 Paul Rusnak is Senior Online Editor for Greenhouse Grower and Growing Produce, another Meister Media Worldwide brand. Rhizoctonia and Pseudomonas can damage crops when not proactively addressed. Here’s what you need to correctly identify and prevent these maladies. Sharing your sustainability practices cultivates customer goodwill and sets an example for other businesses in the green industry. Keith Cable takes on presidential role for plant breeder’s North American region as the company expands its product portfolio. You just never know when and where you’ll come across someone who shares the same affinity and affection for gardening as you do. Crop protection company’s AXXE Broad Spectrum Herbicide product now able to display unique badge that highlights its percentage of biobased content. Learn to accurately detect and prevent fusarium wilt with these production tips. Taizo Chinju has spent nearly half his career with Suntory Holdings in the company’s Flowers division. New agreement would give Syngenta exclusivity in sales and marketing for Varinova cyclamen varieties in the U.S. and Canada. University of Florida is offering full slate of web-based learning opportunities during 2019. Many within our industry are recognizing that the status quo just isn’t cutting it anymore, and they’re making changes to build safeguards for the future. The Perennial Farm in Glen Arm, MD, produces more than 1,000 perennials a year. Here’s what it does to keep them healthy and disease-free. The reasons for young people embracing houseplants are all over the Internet. They are the same reasons everyone else gives for embracing them. Blooming potted plants are getting more attention for home décor and gifting during the holiday season. Growers and breeders are seeing increases in this category thanks to a few factors. Initiative by biocontrol company to implement new environmentally friendly shipping boxes would significantly reduce non-recyclable waste. It is your duty to be certain that claims match with the reality of a consumer growing that plant.